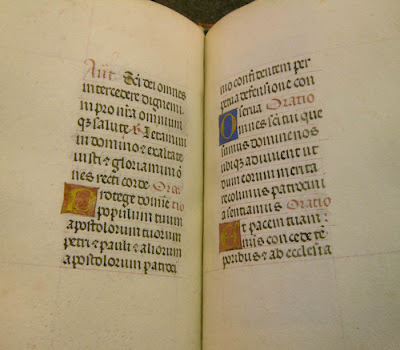 On Friday, at the Rauner Special Collections Library at Dartmouth College, I had a morning like no other I've ever spent: turning the aged vellum pages of hand-painted manuscripts, gazing at words and images from centuries ago. As I handled the four books I chose to look at, I felt not only my face smiling, but also every part of me rising and happy. There was such a difference from looking at a manuscript in a case, protected by glass, to feeling the pages, their weight and texture; the physical contact heightened the aesthetic joy. My excitement is reflected in the length of this post. The librarians at the Rauner were helpful, attentive, and knowledgeable, and very welcoming. I was given a bright lamp at a quiet desk so that I could photograph the manuscripts. When they saw that I needed help holding down the pages in order to photograph them, I was given some weights, one a royal velvet rectangle, like a high-minded bean bag. The first manuscript I asked to see was a copy of the Roman de la Rose which the library had recently acquired, so that it isn't yet catalogued. 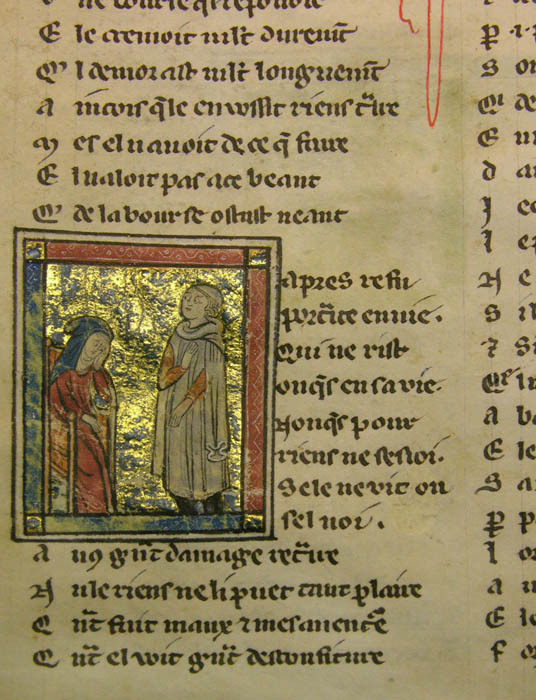 Written by two authors in the 13th century in vernacular French, it is an important secular work. 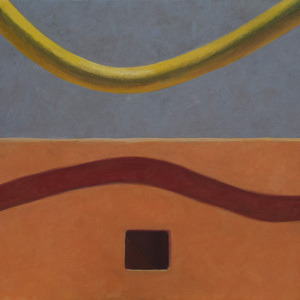 It is a story of love in allegory, a poem of as many as 21,000 lines. 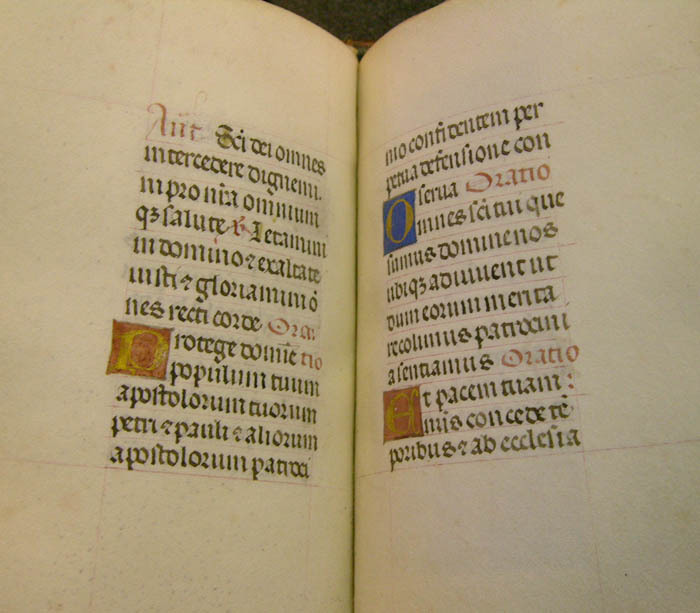 There are about 320 manuscripts of the Rose extant; the copy at the Rauner was made in the 14th century. 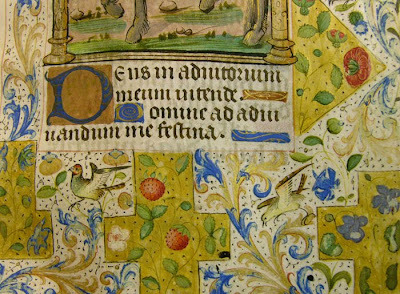 It has double blocks of beautifully written text with some small illuminated miniatures scattered throughout. As with all the images on this blog, you can click on these to enlarge them; the enlargements will be bigger than the original images, but enable closer viewing. I, of course, had to use my reading glasses to see the small, finely worked pages clearly. 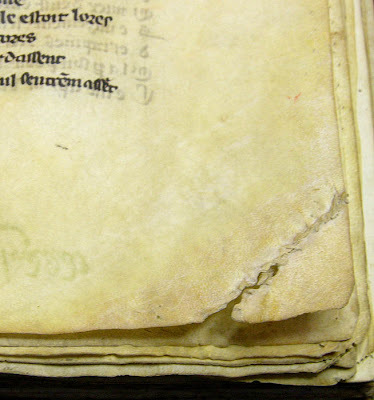 This repaired page in the Rose manuscript touched me: here was an ancient repair, sewn by someone to replace a torn corner of the vellum. The sense of time past, of ordinariness, of abiding care for objects is all here; it makes me want to weep. 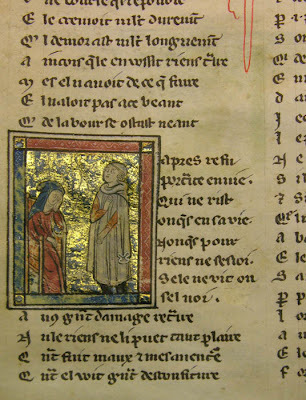 After looking at the Roman de la Rose, the librarian showed me how to access the online catalogue, which you can see here; each manuscript is briefly described and illustrated with one or two images. I chose 3 Books of Hours to look at that morning. 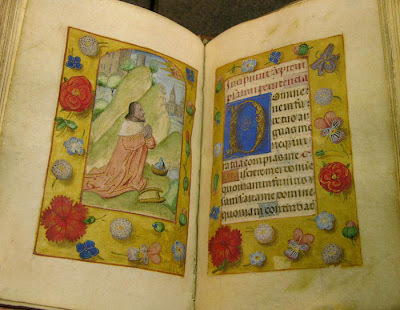 The first was an elegant tiny book with refined miniatures surrounded by borders of poetically painted flowers and fruit. 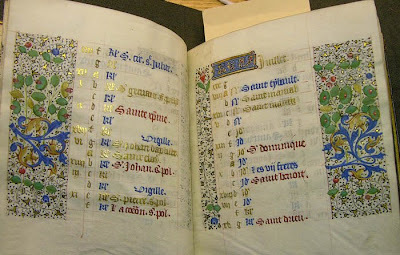 The pages of text were also wonderful to look at; the gothic script, with illuminated letters, was carefully written inside guides lightly drawn in red. As I handled the pages of this small book, I was very aware of the thin vellum, much more delicate than the contemporary vellum I have used in my limited experience. 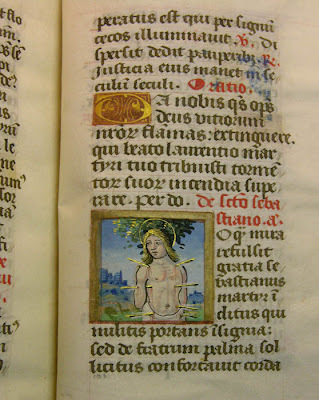 Another page from this book shows a small illumination of St. Sebastien surrounded by text. When I look at these pages, though unable to read them and not a Christian, I am moved by their artfulness; as always, I am struck by those who pay attention to the small things of this world, as also shown in panel paintings of this period that I wrote about here. 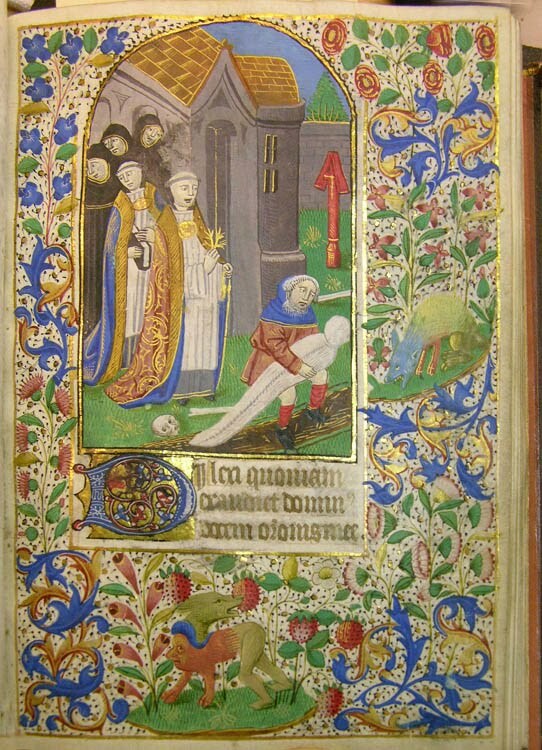 This second Book of Hours that I looked at was made later than the one above; in some notes included in the slipcase, I learned that the style of its miniatures included both medieval and renaissance elements. 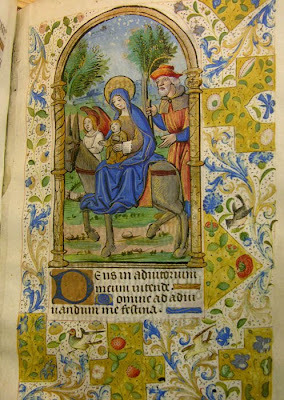 In the "Flight into Egypt" miniature above, both are shown: the renaissance in the architectural surround, and the medieval in the enchanting border. 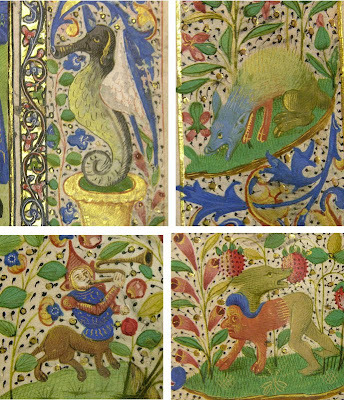 Flowers, fruit and flitting birds, with golden shapes, decorate the border of the miniature; as in other Books of Hours, they are a celebration of creation. 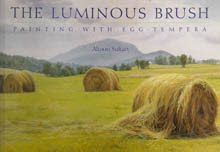 I was particularly aware of the quality of the vellum pages as I looked through this book; some were thick, some thin––though not as thin as the tiny book above––and I could see and feel the texture and variety of the calfskin. Vellum is from a living thing, which I know makes some squeamish, but because it was alive, it has variations that remind us of its origins, so different from the regularity of a machine made piece of paper. Written in my notebook above the codex number of this book is Wow! The design of the pages, the lush, intense color and the inventive illustrations were exhilarating to me. The double page you see above gives a sense of the sumptuous character of this manuscript, with generous use of gold in the text, and richly designed borders. I love the form in this miniature, even though the subject is death and burial; the figures and architecture are simple, solid, and clear, and there is differentiation between the characters: the grieving priests and monks, and the man holding the shrouded figure, an earthy peasant. The violet colored walls are subtly somber, while the green of grass and tree speak of life. 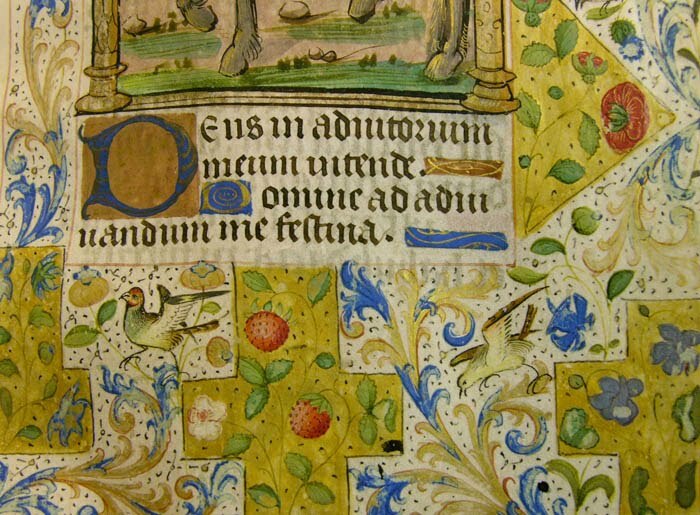 The border is all vivid profusion: flowers and fruits and decorative curlicues. And inhabiting this dense world are two strange creatures, a man-beast and a multi-hued animal. 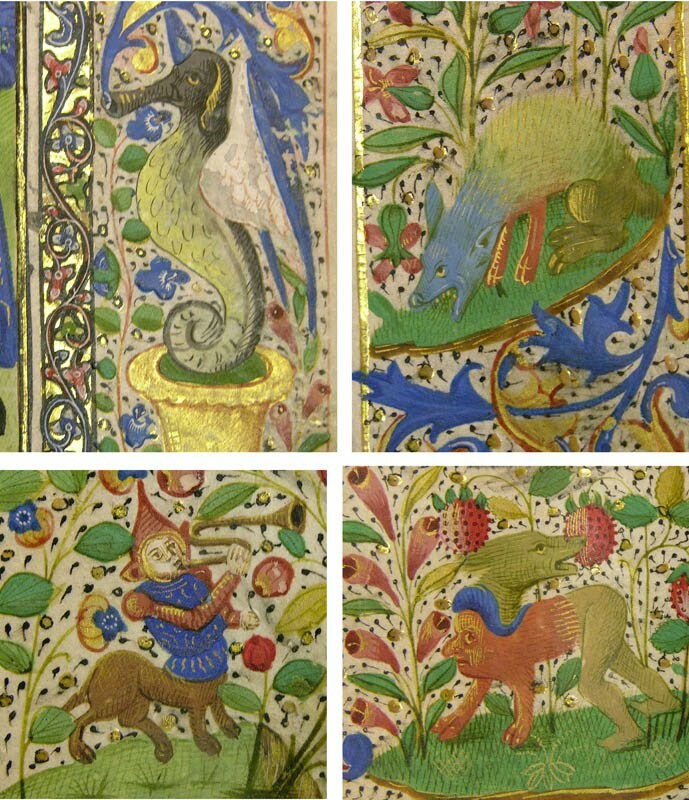 There were various invented animals in this manuscript, some like those on the left below, of humorous aspect, others with a sense of menace. I imagine they point out the lessons of life in its joy and fear, abundance and lack, and the sheer mystery of it all. Altoon: thanks for this marvelous post. I admire how you care enough to make specific observations, drawing my attention where I might otherwise skim. 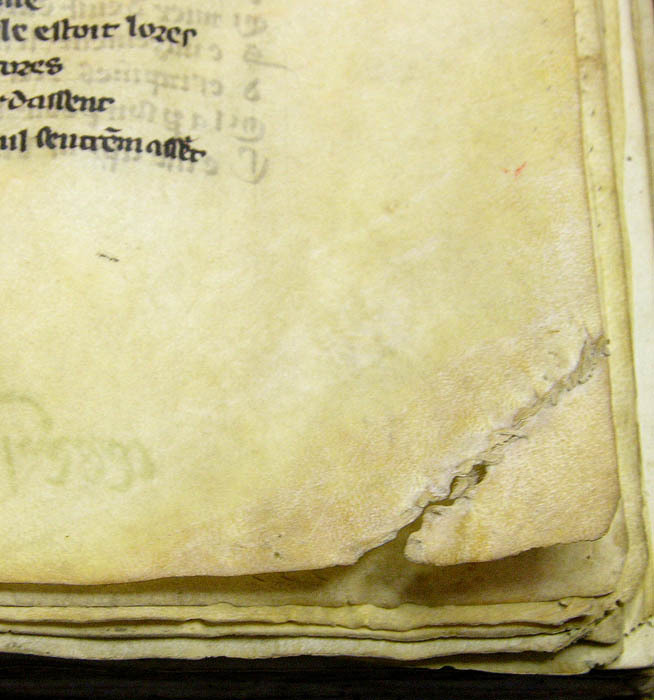 Like you, I am most compelled by the torn page and the visible and invisible history it embodies. I'm really pleased that you enjoyed this post, Julie. Thanks for your close reading and viewing. I've been so screen-oriented lately - you reminded me of the sensuousness of actual material objects - esp historical ones - makes me want to go out and touch some. This is all just stunning. rappel and Helen, thanks for the comments. Touching actual objects is wonderful; as much as I love the computer and digital photography, I don't think I could live without hands-on painting. Helen: take a trip to the Rauner. In my notebook on this blog post is 'Wow'. Have been catching up with your miniatures and tulips and ferns -- funny that we can use the computer to remember and encounter natural and hand-held objects. Altoon, what a wonderful treat this must have been. Thanks for sharing your visit! You're very welcome, Mona. It was an amazing experience. I understand from a friend who teaches at Dartmouth and uses the Rauner a lot that a new head librarian, installed a few years ago, changed the policy of the library to make it very accessible. My hat is off to him.